Ulocladium is a cosmopolitan fungus commonly found as a saprophyte on a number of substrates, including plant materials and soils. Ulocladium may also be found on textiles, fibers, wood, paper, paint, and tapestries. It can also found on water-damaged building material such as gypsum board. Ulocladium spores are mainly dispersed by air. Ulocladium has a high water requirement, and indoors is found where there is high moisture. Ulocladium has a moderately rapid growth rate. The colonies, which reach maturity within five days, are brown to olivaceous-black or grayish, and suede-like to floccose (wooly to cottony). Reverse side of colonies are the same coloration. Conidiophores are characterized as simple to branched, straight or flexuous, often geniculate (bent at the points where the conidia (spores) are produced), leading to a zig-zag appearance ("bent knee"). 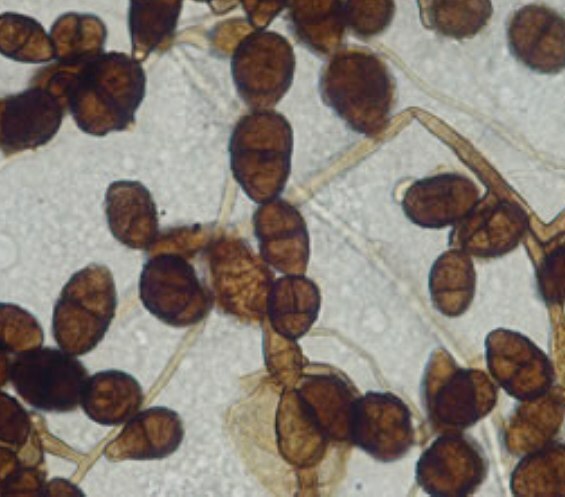 Conidia are brown to black and often rough-walled. They are most or less egg-shaped to cylindrical, and divided into several cells by transverse and longitudinal walls. Most species of Ulocladium are typically solitary (Ulocladium botrytis), but secondary conidia on short secondary conidiophores can give rise to short chains (Ulocladium chartarum). Ulocladium has been reported allergenic, Type I (hay fever and asthma). Rarely it has been the cause of subcutaneous tissue infections in humans. Its ability to produce mycotoxins is unknown.